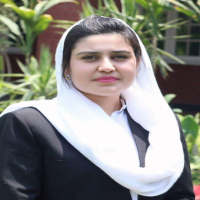 Mehwish Muhib Kakakhel - Female Lawyers in Peshawar / Islamabad - Family / inheritance & divorce attorney - Cyber Crimes - Khula - Maintenance of wife and children. LLM Sindh Muslim Law College, Karachi. MS Computer Science, University of Engineering & Technology, Peshawar. LLB Frontier Law College, University of Peshawar, Peshawar. BS Computer Science, University of Engineering & Technology, Peshawar. Life time member Peshawar High Court Bar Association. Intensive Life skills Training to Gender Based Violence Survivors at shelter homes and community conducted by BEFARe in 2014. Co-Trainer “Islamic and Legal aspect of abortion in Pakistan and in the world” in a session of “Reproductive Health Rights and Access to Safe Abortions” conducted by the Da Hawwa Lur on 2nd & 3rd May, 2018. Co-Trainer in a “Workshop on Eliminating Sexual Harassment through Empowering Transgender in Khyber Pakhtunkhwa” conducted by the Da Hawwa Lur on 25-26 July, 2017. Co-Trainer in a dialogue on “Empowering Women in Decision making through Participation in Political Process” conducted by the Da Hawwa Lur on 16th October, 2017. Represented Pakistan internationally in building gap between cultures through sports in a Dreams & Teams Program conducted by British Council and Youth Sport Trust at Lough Borough University, U.K. Representing a client in a first ever crime committed via WhatApp, who’s fake and Objectionable photos were transmitted in her social circle. Drafted an agreement for dissolution of marriage on mutual consent of both parties. Appeared for a woman who’s minor child was illegally taken by her Husband, who was recovered by the Family Court through police and sent with her mother. Appeared on behalf of a woman and her three minor children in a matter of maintenance, which was ordered by the court as per the need and expenses of the children. Appeared for a man who was not given a visitation right by his wife to see his son, The court allowed him to visit his son every month. Appeared on behalf of a woman who wanted Dissolution of Marriage on basis of cruelty, the court dissolved the marriage and to take dower as per the nikah nama. Appeared for a man whose wife had filed a case for dissolution of marriage on basis of his impotency, The court ordered in favor of our client and ordered the woman to go back with her husband or file a case for dissolution of marriage or Khula. Appeared for a woman who’s dower was taken away and was dispossessed of the house given to her in her Nikah Nama, Court ordered in our clients favor and she was given back her dowry and the possession of the house which was observed to be hers now.